Next to Beast Man (and maybe Trap-Jaw), Skeletor‘s most recognizable henchman is the creatively-named Mer-Man. The original figure was distinctive for his bizarre, vaguely cat-like head (which looked nothing like the packaging art, seen above) and the so-called “corn-sword,” which was supposed to look like an aquatic weapon of the sea, made from a sawfish’s rostrum, but instead came out looking like one of those things you use to hold corn-on-the-cob. On the 1980s cartoon, Mer-Man had a voice that sounded like Alan Oppenheimer gargled whenever he spoke a Mer-Man line. While Mer-Man was little more than a simple henchman on the ’80s cartoon, he got a lot more to do in the original mini-comic fiction of the time and in the 2002 revamped cartoon. Both media went out of their way to portray him as the Ocean Warlord his packaging said he was, king of a city of mer-men and a ruthless warrior. How he came to be Skeletor’s thrall is a story in itself. 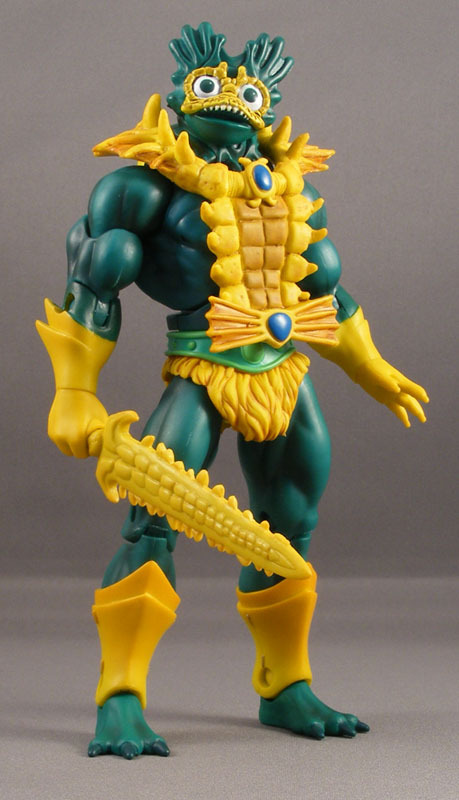 Mer-Man got a well-received update in the 2002 line–in my opinion, one of the best of the updates, since the Four Horsemen took the aquatic theme and went to town with it on that figure, incorporating a groin-guard made to look like fins and some great accessories. The Master of the Universe Classics version of Mer-Man isn’t as detailed as the 2002 version, but it’s still a great figure in its own right. 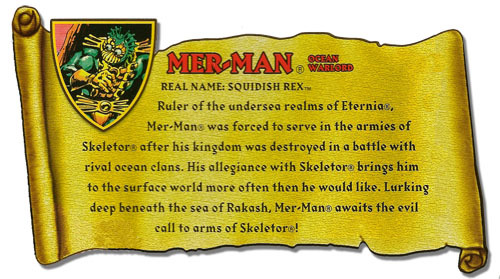 Oh, and he gets a real name this time–“Squidish Rex.” Uh…huh. Packaging: Mattel seems to be learning to minimize the dynamic posing that causes so many problems with their action figures, so Mer-Man has a fairly vanilla pose. However, as has been the case with most MOTU figures, the blister tray in a designed in a way that holds the accessories tightly. I had to be very careful removing the sword, and the spear’s prongs were slightly bent upon removal (but quickly resumed their intended shape after sixty seconds beneath a hair dryer followed by a quick dip in cold water). 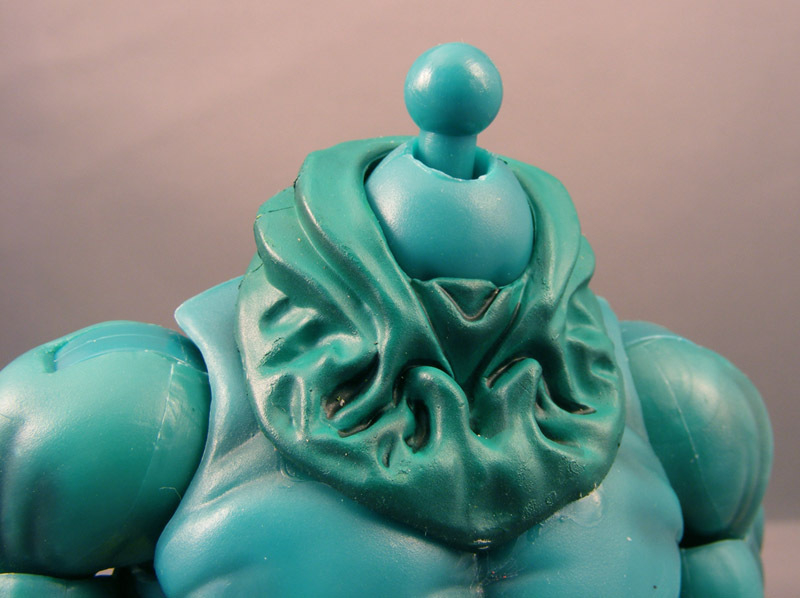 Sculpting: Moreso than any figure in the line thus far, Mer-Man has been sculpted to look almost identical to his original card art (see above). Everything from the unique head, not seen on the original figure, to the open left hand has been lovingly re-created by the Four Horsemen. 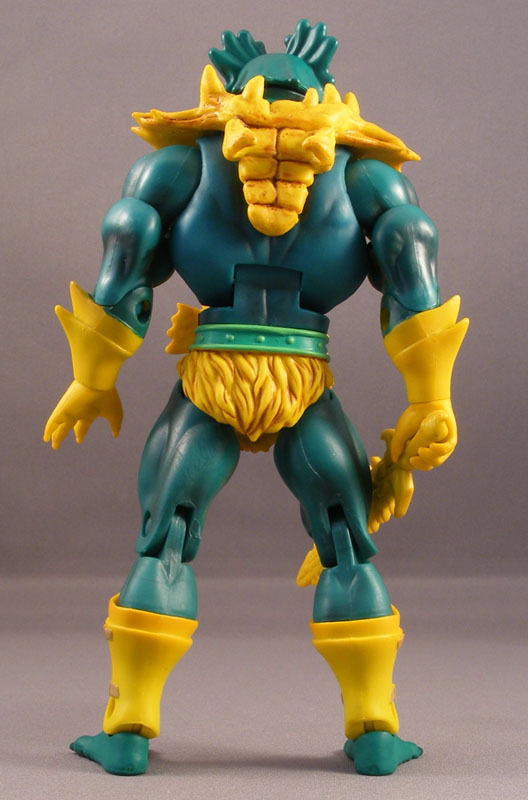 However, so as not to disappoint fans of the original Mer-Man head (later shared with Stinkor), the figure also includes an interchangeable cat-like noggin. While the art-based head looks almost exactly like the 2002 Mer-Man head, the original head almost looks as if it were molded from the original’s figure’s head. The rest of the sculpt incorporates as much detail and style as possible while still remaining true to the original card art. One important bit to note is the neck: there’s an added rubbery piece to give it the look of gills and loose fish-flesh as seen in the artwork. As far as I can tell, it isn’t removable. A nice touch and an example of the extra mile Mattel went with this figure. 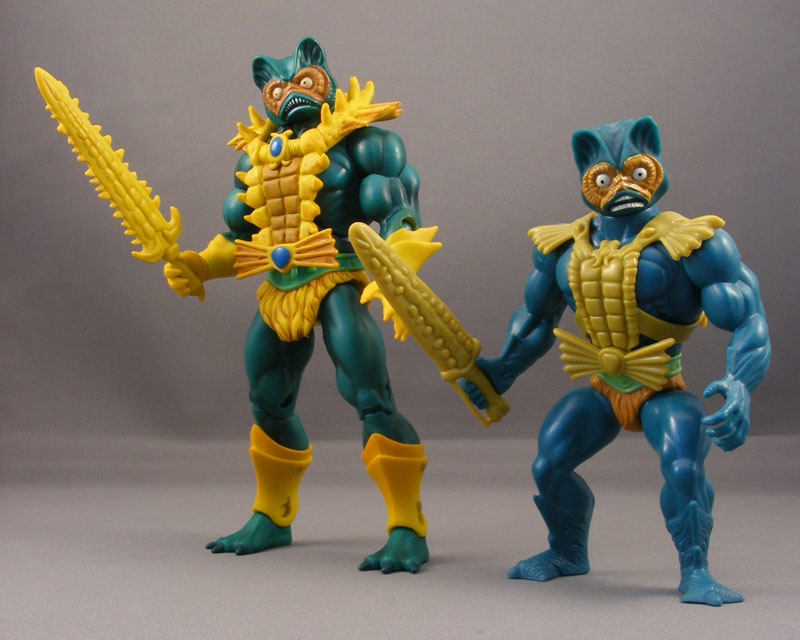 Some collectors have been disappointed by the open left hand, which prevents Mer-Man from being able to hold both his weapons at the same time. While an interchangeable gripping hand would have been appreciated, if I had to choose one or the other I would’ve gone with the open hand for variety’s sake. As for the head sculpts: it’s a testament to the Four Horsemen’s skill that they’ve somehow made Mer-Man’s original head appealing. 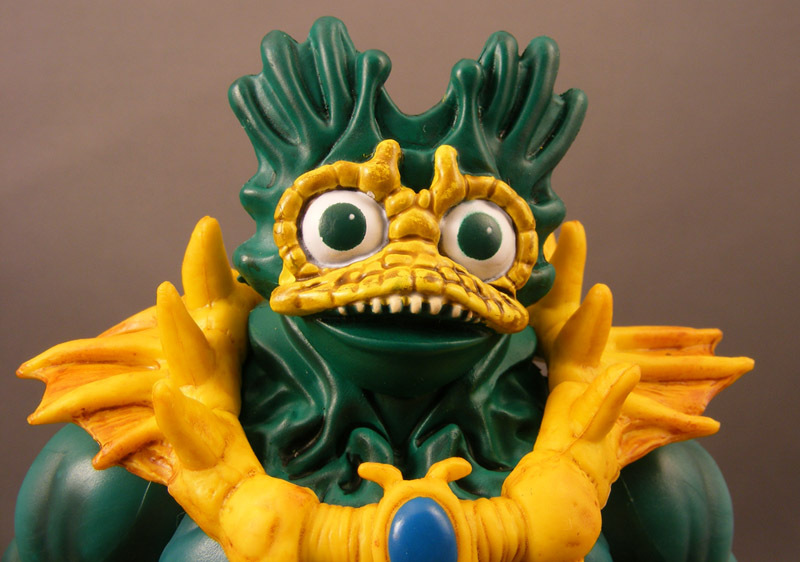 The art-based head, while better matching the figure’s overall design and aquatic theme, has huge muppet-like eyes and what almost seems like a goofy grin. The original head looks a lot more monstrous. I can see myself switching between these heads frequently. Plastic & Paint: Mer-Man is molded primarily in a green plastic that’s of a darker, less bluish shade than the original figure (or at least the 2001 reproduction figure I used in my photos). His forearms, shins, hands and heads are cast in yellow plastic. The loincloth is also cast in plastic, which is different from the original figure (which had an orange loincloth to match the orange highlights around the original head’s eyes), but matches the card art. While the paint work on most MOTUC figures so far has been fairly minimal (owing to the design and the generally dark colors), Mer-Man seems to have gotten the works. For starters, he has a nice black wash that highlights his muscle tone and gives him a “from the depths” look that serves him well. There’s some very nice work on the armor, which also has a light wash and some darker paint around the torso section, which perfectly matches the card art. In a deviation from the original figure, the jewels on his neck armor and belt are blue, which may be a nod to the 2002 figure. Articulation: Mer-Man features ball joints at the shoulders and hips, hinge joints at the elbows, knees, ankles and abdomen, and swivels at the biceps, wrists, waist and calves. He also has some excellent “rocker” ankle joints that allow him a wide stance. The head articulation is a bit tricky. Owing to the large rubber neck piece, the range of motion is a bit more limited than we’re used to. Thanks to the way the neck peg is set up, there’s a decent amount of room to move the head up and down, but the side-to-side motion is limited–he has to twist his head up and to the side to look in either direction. Given Mer-Man’s unusual physiognomy, I don’t think this is that big a deal, though–who knows how well a fish-man would be able to look left and right? Accessories: Mer-Man comes loaded up with the best accessories we’ve seen on a MOTUC figure this far. He has the two interchangeable heads, removable armor, a trident, and his infamous sword. While it’s sharper and looks more like an actual weapon than the original figure’s corn-sword, MOTUC Mer-Man’s sword is still fairly corn-like. Still, it has some great detail, and the teeth of the sawfish rostrum are actually visible. The sword can be sheathed in the back of the armor. The trident fairs even better, though. This traditional fisherman’s weapon has a much more detailed look and texture than all the weapons we’ve seen in MOTUC so far. It has a rough texture, almost like bone, and the entire weapon itself seems to be made from bone (Dr. Mrs. Ghostal pointed out that the prongs appear to be finger-bones ending in talons). There’s a nice dark wash all over the weapon, giving it a grimy, mildewy look. The blue jewel is also quite sharp-looking–at first I thought it was a separate piece. Quality Control: Aside from the aforementioned issue with the trident’s prongs, my Mer-Man came in great shape. I’m very pleased with Mer-Man. While not my favorite MOTUC figure so far (that’s Skeletor, who’s likely only to be surpassed by Trap-Jaw), he’s almost certainly the best to date. For those who prefer to cherry-pick this admittedly expensive line, the great sculpt, excellent accessories and interchangeable head make him a must-buy. I'm SOLD! I've decided to sell off the rest of my dcuc to finance all the motuc figures! Hopefully my loose black and gray batmans will sell for a lot…sigh. As for the tightly fit weapons in the package….why not just rip the tray apart? I opened up a skeletor last night and ripped the figures's plastic tray to get to his half sword. MOTUC Mer-Man rocks. Easily the best figure produced so far. Man mine is still not here yet. And I want it so bad. I hope mine arrives soon. I'm anxious to see how he looks in person. Good review Poe. I posted mine up on my site a couple of days ago. Mer-Man was the first MOTUC I actually got to review because I haven't taken the others out of their plastic tombs yet. But Mer-Man definitely impressed me. I dig your site, Newton. Mer-Man is definitely a showcase for the line. While I think I'm going to pass on some of the figures to save some dough I do love Mer-Man and look forward to some of my other favorites (She-Ra in particular). Mer-man isn't my thing, but I think they did a great job replicating the original card art. I'm worried about the future of this line, because it is becoming clearer and clearer that if you are a fan but don't place an order within HOURS of figs becoming available, you may lose out. And though I would appreciate the packaging staying consistent, Mattel should make it a tad taller so the unposed figs don't have their heads disappear behind the logo (see the upcoming Zodac). All that said, bring on Man At Arms! @misterbigbo: Mattel is or at least claims to be working on this issue. They've had the same # of figures produced for each figure so far. Mer-Man is the first one they've actually had extra stock for. Hopefully they'll get it right eventually. As I pointed out in another post, the popularity of the line is growing, and people have realized they can't wait to order one. Thats why with each figure the time they've lasted has always shrunk in half. He-Man & Beast Man: 30 days, Skeletor: about 15 days, Stratos: 4 days, etc… till we got to the craziness of Mer-Man selling out in under an hour. Mer-Man was never one of my top favourite characters, but I think so far he's possibly the best MOTUC figure produced. That picture Poe posted with the two is just fantastic and pretty much say it all, what this line is about and hopefully something they'll continue to top themselves with. I sincerely hope Zodac sells out, and that everyone who wants one gets one. Being that he isn't a heavy gun like Hordak, Skeletor, He-Man or Man-At-Arms, people who've been cherry picking so far (but buying everything, cuz everything's been awesome) won't pass. I don't want to give Mattel a reason to say, "Hey, we increased numbers to meet demand, but we've still got a thousand Zodacs sitting in our warehouse collecting dust…"
@ pftear: “Hey, we increased numbers to meet demand, but we’ve still got a thousand Zodacs sitting in our warehouse collecting dust…"
This is exactly what i think will happen. I could be wrong but I think zodac won't sell out immediately just because he's such a generic plain boring figure. There's just nothing unique about him like skeletor, merman beastman. Even Stratos is at least a funky unique character. I've spent quite a fortune getting a mint set and a loose set of all the motuc (except king grayskull) and i've decided to buy all the cardback characters EXCEPT all but ONE character: Zodac. I HATE to have a hole in my "cardback" motu collection but geez louise is he plain as hell. I won't be a completist with this line because I don't wish to collect the POP or New Adventures characters but man this is THE ONLY line i collect now! Its GREAT to focus on just one line (at least it is for me). @Monte: Thanks man, I'm a big fan of yours. And Poes. @Jim, I am excitedabout Zodac as I have some great memories getting my original Zodac, which I still have 100% complete, but the Classics version are so much better. As cool as Mer-man is I will displaying mine with the original head. Does anyone notice the right bicep of merman has a slit from a blade? Almost every merman had one at the toy show i went to. Lastly, I will be displaying him with the Classic Head as well. I tried the cardback/modern/2002 head and geez does it look so goofy…flat face, dorky eyes, wierd sagging lower mouth. He looks like the kid version of Merman like the Marvel and DC toys that look like the RESCUE HEROES (DC Superfriends..Spiderman and Friends). Although many say Merman is the best MOTUC figure to date, I just can't say the same…not because it's not a great figure…I LOVE IT, but because it's the same sculpted figure with different colors, a different head and a different styled chest piece. I LOVE this LINE! It's the only one I collect! 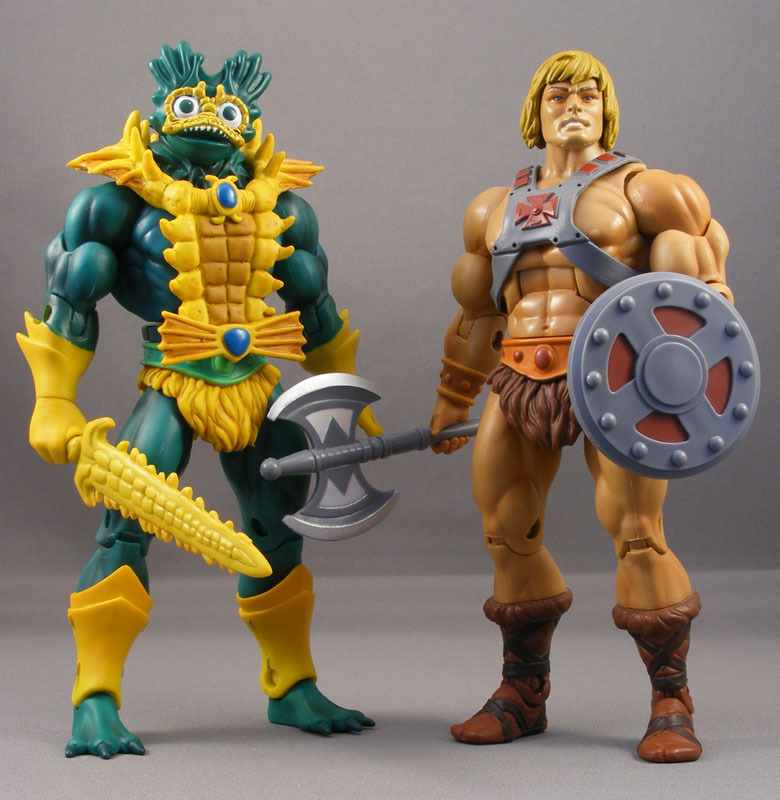 BY THE WAY…does anyone know which came first…the hooked or unhooked version of He man and Beastman. I just picked up a MINT creaseless carded heman and beastman with NO HOOK. Wanted the HOOKED one, but it was the only ones creaseless. I wish i could edit my last comment…I figured out how to display the 2002 head in a way that actually looks better than the classic head. The 2002 head looks way more interesting! @Jim: I agree, Zodac is a rather bland character. Visually he's not the most interesting character, and he doesn't have any interesting powers, "oooh! cosmic enforcer… he rides around on a pimped out chair!". I don't even have any memories of him from the Filmation series from watching as a kid. I thought the '02 update was cool though. That said, I think the MOTUC figure looks great and I'm planning on getting him. Yes I agree that basically what it comes down to is the paint job, head sculpt, and one other very important thing you forgot to mention, accessories. At least he gets a gun though, I wish they'd given Stratos something to hold, whether it be the generic gun, or that rod or whatever. 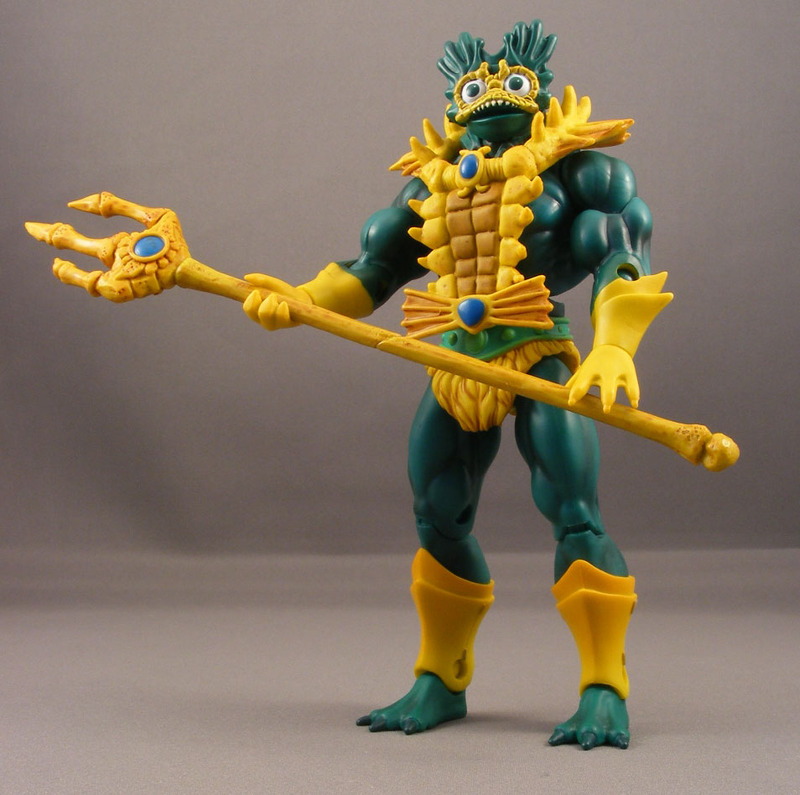 Mer-Man has the distinction of being the first character to offer an alternate head, plus he gets his trident staff, and his corn on the cob sword. Skelly is the only one who had as many with his Havoc Staff, evil sword, and his half a sword. I was disappointed with Faker, since he didn't have a shield/axe included. I think that would have been nice. @Jim, congrats on getting the entire lot of MOTUC. 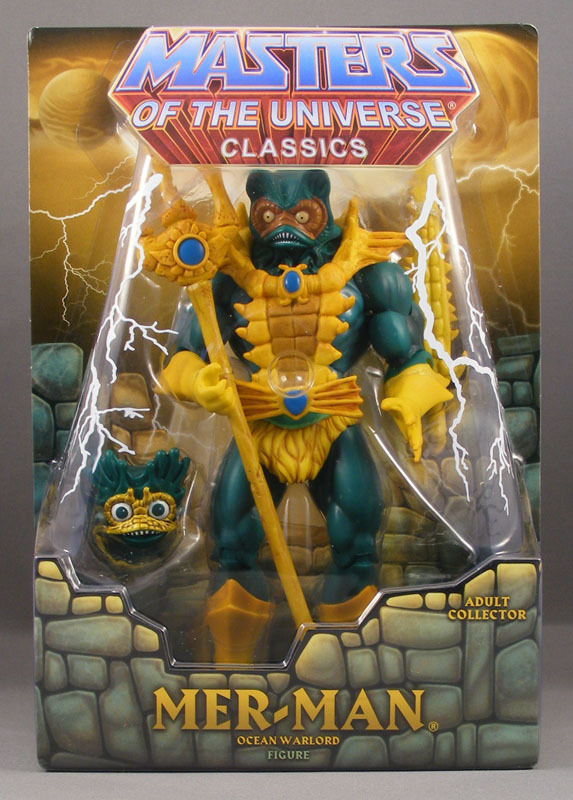 Maybe I will feel different when I get Mer-man but for me its the classic head. I am focusing on the MOTUC line with just the odd Transformers and G.I. Joe toy. Would love to get Masterpiece Grimlock. I got Hall of Heroes Snake Eyes V2, it is awesome, best 25th version of Snake Eyes. @pfktear or anyone: Do you remember the Spawn Classics figure of Medievel Spawn? There was one where he had a HUGE AX and a Sheild with 3 super fragil arrows on stuck on his shield? Lastly, pfktear what do you think about the cast of GIJOE? I'm not too happy about guys like Channing Tatum playing Duke or Marlon Waynes as rip cord. I just can't take both seriously as GIJOE members. @Mark: Hey Mark! Thanks for the comments! Masterpiece Grimlock is AMAZING! I think if I were to collect ANOTHER line. I would buy ALL the TF Masterpieces! I bought Megatron…then Starscream. Starscream turned me off to the line because during transformation…his wing connection broke off. I was like…WHAT THE HELL! I paid a fortune for this cheap crap?? But to be fair, I didn't get the directions of the starscream transformation from jet to robot. I wished they packed it in as robot form like prime and megatron but i guess it was to save space? @Jim, I bought my Mer-man today. Why does everyone keep saying Grimlock is amazing…everyone should be discouraging me from buying it…LOL I dont want to spend that much money….I have to buy MOTUC….and some Joes…my budget will not allow it. Although I could sretch for Grimlock then take a break. I like the Masterpiece line well enough, I have Prime, but after all the reviews of Starscream being fragile and Megatron it put me off, I would really need to know for sure that he is durable as I have purchased some other high priced robots that were not very durable and broke being removed from the packaging. One thing about the G.I. Joe movie…I am not keen on the cast either, I mean Duke has brown hair, and Cobra Commander…less said the better. Personaly…I think they should have cast me in a role, then it would have been amazing LOL, I could have been Beachhead, except with a Northern Ireland accent. @ Mark: I think AT THE VERY LEAST…the masterpiece Starscream should have had more concise directions for the transformations. @Pixel Dan, love you video reviews of the MOTUC.